Many of our readers have been asking for more stand-up comedy, and today we're happy to oblige. It's been harder and harder to find funny Jewish stand-up comedians who don't depend on vulgarities to get laughs, but they're out there, and we're finding them. Some are newcomers to comedy and some are veterans. Perhaps you've seen Cathy Ladman perform on TV and in live shows, but somehow we missed her until now. Cathy's comedy focuses on family, growing up, relationships, and real life from a very personal perspective. 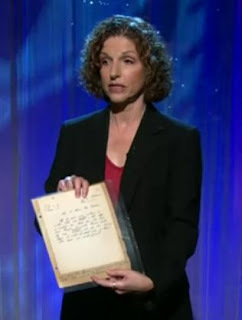 Cathy Ladman appeared on The Tonight Show nine times and was also the only female comic to appear on the last two Johnny Carson Tonight Show Anniversary shows. Cathy has had her own HBO One Night Stand comedy special and, in 1992, was awarded the American Comedy Award for Best Female Stand Up Comic. Most recently Cathy was one of the three finalists in Nick at Nite's Funniest Mom in America. Today we're sharing two video clips. In the first, Cathy talks about being too Jewish. In the second, on Craig Ferguson's show, she explains how exhausting it is to have a six-year-old child and reads her own compositions from when she was nine years old in the fourth grade. Love her......always have! A Smart,Funny,Classy Yiddisha Woman! ROCK-ON ! M.A.